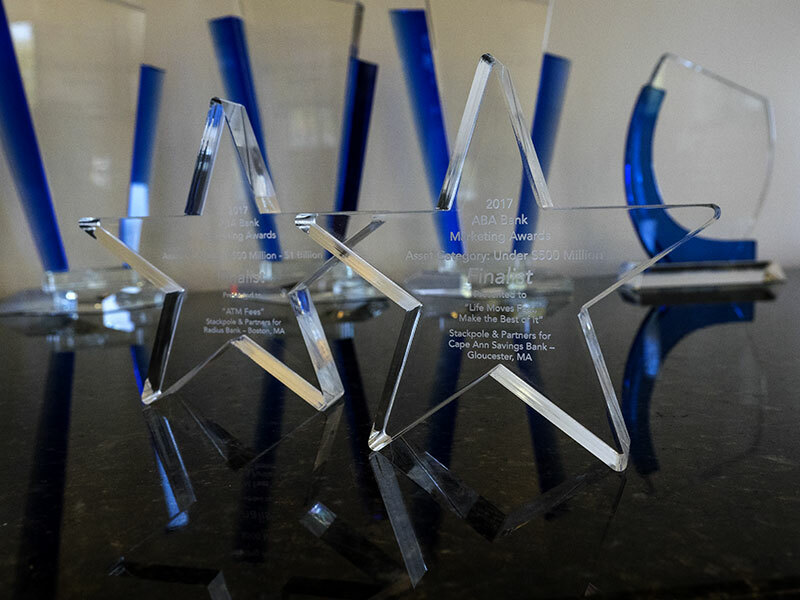 Stackpole is pleased and proud to announce that they are the only U.S. marketing firm to be named as a finalist in two separate awards categories at this year’s American Bankers Association (ABA) Video Awards. Our president, Pete Stackpole, was on hand at the ABA’s flagship conference in New Orleans, where an esteemed group of nominees gathered for the Awards Event. For Radius Bank, the Stackpole video submission in the $500 million – $1 billion asset category is part of a campaign reflecting Radius’ desire to reposition itself as a virtual bank outside the Boston market—where it’s known as a full-service consumer and commercial bank—and to begin to introduce the concept of “branchless” banking for people unfamiliar with the institution. In the under $500 million asset category, Stackpole was nominated for their work on a 30-second television spot for Cape Ann Savings Bank that positioned the bank’s Trusts and Estates Division as the knowledgeable, local and approachable Financial Advisor — helping the community plan responsibly for retirement, as well as for all of life’s key milestones. Everyone at Stackpole wants to congratulate this year’s contestants whose great work was considered for the ABA awards. It’s an honor to be in such terrific company.